“Friendship is like a seesaw. when your friend is up. Barron’s “A Big Hug” series offers a gentle and direct approach to the emotional issues that children face. Written by a clinical child psychologist, these books encourage youngsters to share and discuss tough topics with family and friends. “Friendship is Like A Seesaw” compares friendship to the classic playground ride–there are ups and downs, but in the end it’s all about balance. Endearing illustrations and gentle text explore friends at their best–sharing, laughing, and playing together–as well as friends who sometimes say hurtful things, leave others out, or get a bit bossy. The authors go on to discuss what we can do to rebalance and fix our friendships, like talking about our feelings, looking at our own friendship skills, or taking a break. A timeless lesson that older children and even adults can appreciate. During the holidays, a friend of mine gifted me four books from Innes’ A Big Hug series. Friendship is Like a Seesaw caught my attention the most, so I chose to read it first. As a lover of children’s literature, I’m rather picky. However, Innes’ did not disappoint. Beautifully illustrated and well thought out, Friendship is Like a Seesaw is a beautiful addition to add to any child’s reading repertoire. Since the series are similar in format and design, I will only be writing a review for Friendship is Like a Seesaw. Innes’ Friendship is Like a Seesaw discusses the elements of friendship in a way that children can both comprehend and learn from. In a lovely first person narration, the story highlights on how friendships are…”like a seesaw”; there are highs and lows and balances. Sometimes your friend is doing grand while your feeling low; sometimes your feeling wonderful and your friend is in a slump; and sometimes, you’re both at the same place of joy and wonder. For a children’s book, the story is pretty blunt and detailed when it comes to friendship. Innes’ book teaches important lessons that sometimes we sugar coat or hide from children: friendships are beautiful but sometimes don’t last forever; people who we think are friends sometimes really aren’t, and that’s okay to let them go; some friends are not only important early in life, but they stick with you all your life. THIS is what we should be teaching our children, not telling them it’ll always work and fixing their issues for them. These social skills are crucial to a child’s development, a point that Innes drives home rather successfully. Innes also leaves a small message at the back of her books for parents and teachers, discussing ways in which they should approach their children when they begin making friends and having quarrels. So it’s not only a teaching tool for children, but it’s also one for adults. Being a clinical and forensic psychologist, I feel this further validates the information she provides in the novel and her message for parents and teachers. So…why three cups of year? Well…I found it kind of boring and a bit of a lackluster. Don’t get me wrong, I think this novel (and the others in the Big Hug Book series) provide amazing insight and guidance on raising children, but I was bored quickly and could easily see children growing tiresome REAL quick. There aren’t really any main characters in this novel. The story is told from a narrator not in the story, set as though it’s supposed to be told from the parents or teachers own creation/design. The characters who are detailed in the novel visually are animals, such as elephants and mice. Thus, there’s really not much more to say on this point until discussing the illustrations. Oh look at that, the illustrations and artwork section! That was quick. As I just mentioned, the characters illustrated on the pages are commonly known animals. Írisz Agócs’ watercolour illustrations are remarkably stunning, drawing readers’ attention quickly; these alone would entertain both children and adults alike as they read through the story. The animals are approachable and fun, making it easier for children to process and relate to. Their beauty also helps keep their attention focused, even when the story begins to falter a bit. Honestly, I would use these are decor for a child’s bedroom…if I had a child…which I don’t…and don’t plan to for a while…moving on now. The language is well thought out, making it easy to read aloud and follow along to. Innes really focuses on vocalizing the life lessons strongly…and I personally believe that’s where this hurt the story. The language was good, but it wasn’t GREAT or GRAND or BEAUTIFUL or FANTASTIC. It was simple and straightforward. Yes, maybe this makes it easier to teach children life lessons, but it didn’t make the story fun or silly or exciting. When I read children’s literature, the language is the section I critique the most; authors need to be able to both teach and entertain, bringing the story to life through the words. However, Friendship is Like a Seesaw didn’t cut it for me. 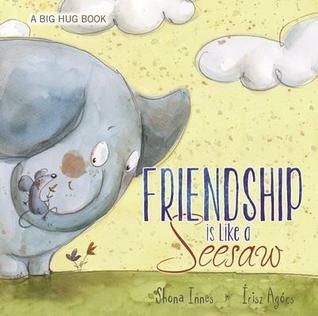 Innes’ Friendship is Like a Seesaw is a beautifully illustrated children’s book, which highlights the key points regarding the development of friendships for both children and adults. Though the language was a little bit of a disappointment, the story still has a beautiful message behind it and the illustrations are truly wonderful to peruse through. How do you feel about Friendship is Like a Seesaw?